The Battle of Rheinfelden was in fact two battles fought in 1638 to the north and south of the present-day town of Rheinfelden between a mercenary army led by Bernhard of Saxe-Weimar and an imperial army led by Johann von Werth. Bernhard was defeated in the first battle but managed to defeat and capture Von Werth in the second. Following the Swedish defeat at the Battle of Nordlingen in 1634, Bernhard's mercenary army had come under the pay of France. Having been pushed back over the Rhine by the Imperial advance Bernhard's army had settled in Alsace during 1635 and had done little except help repulse the Imperial invasion of France under the Cardinal-Infante Ferdinand and General Gallas in 1636. Early in February 1638, having been prodded by the French government Bernhard advanced his army to the Rhine in order to find a crossing. 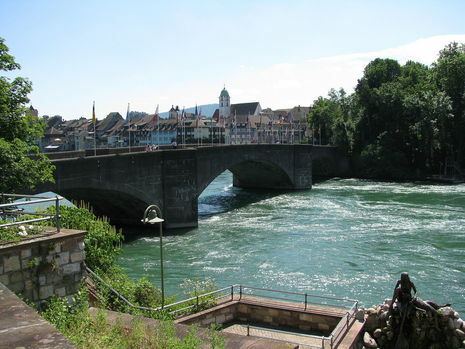 Arriving at the town of Rheinfelden (an important crossing point) Bernhard prepared to invest the town from the south and using the ferry at Beuggen threw troops across the river in order to complete the investment from the north. The attack on the town was to be made on March 1. In order to prevent this the Imperialists under the Italien Mercenary Count Savelli and Johann von Werth moved through the Black Forest to attack Bernhard's army and relieve the town. The advance guard of the Imperial army, coming down the right bank of the river was pushed back by Bernhard. This gave him time to deploy more troops and artillery onto the north bank of the river. However by the time Savelli appeared with the main body of his force only half of Bernhard's army had made it to the north bank. Bernhard drew up his army to prevent Savelli from relieving the town. Savelli drew up the Imperial army opposite but because of the rough ground there was little chance for both armies to retain their formation. Savelli drove back Berhard's left flank but on the opposite end of the field Bernhard routed the Imperial right. Like a revolving door both armies swung round giving Savelli the chance to capture the ferry and cut off Bernhard from his troops on the south back. At the days end the armies were facing each other in the positions that the other had started the battle in. Believing Bernhard's army defeated and scattered, the Imperialist army failed to take precautions. Around 7 am Savelli's outposts were astonished to see Bernhard's army approach and withdrew towards Rheinfelden to report Bernhard's presence as Savelli and Werth assembled their army in haste. Bernhard had his artillery fire three times into the Imperial ranks before a final charge broke the Imperialist army. Troops coming out of Rheinfelden to help were also caught by Bernhard and forced to surrender. Both Savelli and Werth were captured.